Raising a child is one of the most joyful things that one can do in life. However, receiving bad news about your child’s health and wellbeing can be absolutely crushing. This was the case for 4 sets of parents in Florida, whose daughters became best friends in hospital while they were being treated for leukemia. Now, they’re sharing the wonderful news that all four girls have recovered and are now living cancer-free. The adorable kids became close when they met in the hospital. Now, they’ve met up once again, this time to celebrate their victory over cancer. Just look at this picture of them full of energy and life! 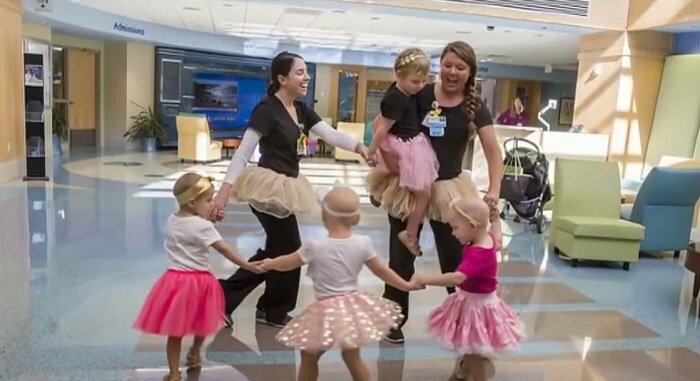 Not all of the girls had the same form of cancer, but they were all treated at John Hopkins All Children’s Hospital in St. Petersburg, Florida. The girls, who are named McKinley, Ava, Chloe, and Lauren, met two years ago when undergoing treatment. John Hopkins is a hospital that specializes in pediatric care and has been named one of the top 50 children’s hospitals in the world. As well as the top-quality medical care and the love of their families, it was their friendship that helped them get through their cancer treatment and life in a cancer ward. It also helped the tots to feel like they were not alone. Whenever they weren’t undergoing cancer treatment, the girls talked and played together as much as possible. The love and joy of their friendship also helped their parents through what must have been an unbelievably tough time. “Amazing to see how far they’ve come from being bald little babies,” said Alyssa Luciano, mother to Ava. Their former nurses were also there for the photo shoot, and were overwhelmed with joy that the girls are happy, healthy, and together. When the friends first met, they were all undergoing active treatment. They had no hair due to chemotherapy and other treatments, and it was a frightening time for the kids and their families.